Major kitchen and restaurant renovations at an historic Alton pub are nearing completion – just in time for the start of the summer season at the UK’s biggest theme park. James and Gemma Miller bought the Bulls Head in 2016 and have transformed the 17th Century inn from a derelict shell to a thriving local pub. Now phase two of an extensive programme of work has seen the pub kitchen and restaurant reopen, while work is underway on the creation of a stunning oak beamed function room with capacity for parties of 200 people. 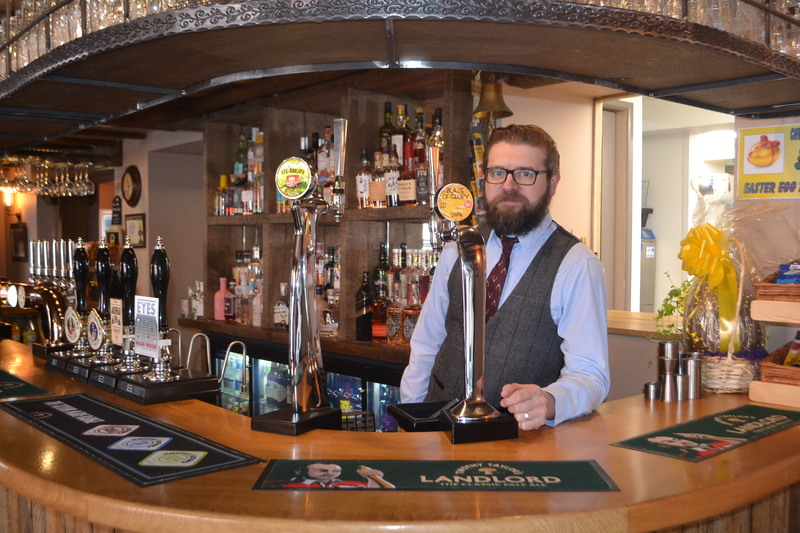 Renovating the Bulls Head has been a labour of love for James who grew up in Alton and first visited the pub as a teenager. He said that the latest phase of work had cost around £25,000. “The kitchen opened in early March and we’ve been serving food in the bar while work has continued on the restaurant. It will be open in time for Easter and the start of the summer tourism season. Tourism has a huge impact on the viability of businesses in Alton as we are close to the Peak District and have Alton Towers on our doorstep. “This year is set to be a big year for the Towers following the investment of £16 million in the new Wicker Man rollercoaster which is already creating a major buzz. 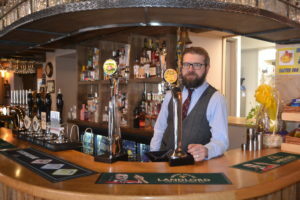 Renovations at the Bulls Head have created 15 jobs and James and Gemma have a growing reputation for their extensive range of high quality craft beer and gins. The pub has won recognition from Uttoxeter and District CAMRA and has been awarded Champion Club status by famed brewer Timothy Taylor. “I have always had a passion for seeking out high quality beer and this is reflected in the pub,” explained James. “We have Timothy Taylor ale on the bar, including Landlord pale ale, a favourite with many real ale drinkers, and Timothy Taylor have recognised as a member of their Champion Club because of the quality of the beer we serve. “There’s an extensive craft ale range including bottles and cans from breweries across the UK and beyond and we have become well known for our gins, with over 60 varieties. The Listed building was derelict before James and Gemma bought it along with the neighbouring former Co-Op store. A year-long restoration area saw the pub extended into the shop, creating space for a new entrance and seating area, and the installation of an imposing oak bar. The Bulls Head reopened in June 2017 and has restored its former reputation as a hub for the Alton community. “Work on the building has been extensive as everything had to be stripped back and rebuilt. We took the decision to launch without food and that has proved a success but we always recognised the potential to attract local people and tourists who want high quality, home cooked style food in a historic village pub. “We attract staff from Alton Towers into the pub and are confident we can build that audience, particularly during the summer when Alton is busy with tourists. The final stage of the renovation is the completion of the oak beamed function room at the top of the historic building, which will be available for weddings, parties, community gatherings and corporate events and will lead to further job creation.